Posted by SeriouslyNails in Nail Art, Nail Art Tools, Where the inspiration comes from! So, I am checking out a new yoga studio here in Las Vegas. The first thing I noticed at this new building was the signage. It is a new building and the sign was temporary (I believe) but I loved the bold colors of their sign. Also the business card has the same design but in different colors. 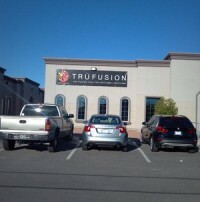 This place has a wonderful diversified selection of classes for every level of yoga enthusiasts. With some fun twists on them as well. How about Hot Yoga Blues!?!?! As well as Kettle Bell, TRX, Pilates and Rope training. Hot Yoga and Hot Pilates are also available. Anyways, I will let you know how it goes! But the reason for the post was to show you my toes that I fashioned after their signage. A little show and tell for you. I used Sinful Colors “Easy Going” as the base color. Allow to dry completely. 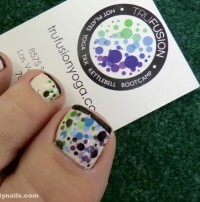 Next I started making dots on the right side of my nail on the big toe. I used three different colors, just like the signage. I know it may sound weird but I started with the lightest colors and then worked up to the darkest colors. I also made the light colors smaller is size than the darker ones. It gives a very different effect. 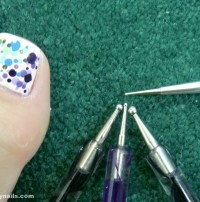 I also have, oh, just a couple of dotting tools in my collection so the job was easy! 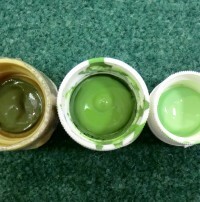 Working my way from one color to the next and using the different size dotting tools, this is how it progressed. The last color was applied and the look was super cool. But I needed to incorporate the black that was around the art on the business card. I also wanted the colors to flow into the toe next to my big toe so it didn’t look completely out of the loop! I opted to do a french tip in OPI’s “Lincoln Park After Dark” just to keep it from being too stark. The final product was cute and a bit whimsical. 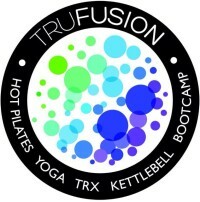 I showed it to the people that work at Trufusion Yoga and they loved it! Here is the nail art with the inspiration.